dang tong district, Kampot pro­vince – Inaugurating the country’s largest cement factory in Kampot province on Monday, Prime Minister Hun Sen said the plant would help fuel Cambodia’s building boom and offset the current over-reliance on imported building materials. Describing Kampot Cement Co Ltd as the country’s first modern cement factory, Hun Sen said the plant aims to produce 2.7 million tons of cement per year by 2012. Cambodia imported 1.5 million tons of cement in 2007 and is expected to need some 2 million tons of cement in 2009, Minister for Industry, Mines and Energy Suy Sem said at the opening ceremony, adding that in previous years almost all cement in Cambo­dia had to be imported. Kampot Cement—a joint venture company established by Khaou Chuly Group, a Cambo­dian construction and engineering firm, and Thai-owned Siam ce­ment—has already invested $127 million dollars in the factory, which employs 520 workers, Khaou Chuly Group President Khaou Phallaboth said by telephone Monday. The factory, which began operations in 2006, currently has the capacity to produce 960,000 tons of cement a year. According to Suy Sem, the factory will use stone from two nearby mountains, Phnom Totong and Phnom Touch. 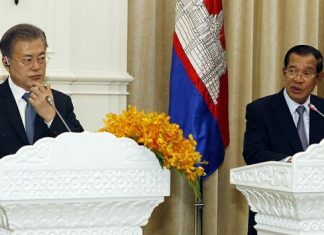 Hun Sen said the demand for cement would increase in coming years due to a number of huge planned construction projects. “We are hungry,” Hun Sen said. “We need a lot of products,” he added, urging the factory’s owners to produce a high-quality product, which would compete fairly with imported cements. 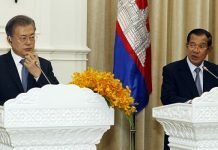 “There is no policy of protecting domestic goods by stopping im­ports,” Hun Sen said. “If you produce a low-quality product, no one will buy it,” he said, adding that another way to beat an over-reliance on imported goods was to stop smuggling, which not only kills demand for domestic products but also loses the government tax revenue. 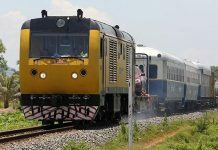 Khaou Phallaboth said that the biggest concern for Kampot Ce­ment will be foreign companies dumping their goods at below-cost prices on the Cambodian market.